Children’s Pythons are native to Northern Australia and are one of the smallest pythons in the world usually only growing to 2-2.5 feet in length but can reach 3 feet. They get their name from John Children, a zoological curator of the British Museum in the 19th century, versus being labeled as a python for children though these animals do make good pets and are recommended as a solid first, or beginner, snake. With proper care they can live more than 20 years so it is important to understand the commitment when choosing this snake. Adult Children’s Pythons should be housed in an enclosure around the size of a 20 gallon aquarium while younger animals can be housed in something closer to a 10 gallon. The enclosure should have at least two hides, one on the warm side and on the cool side (heating will be discussed in the next section). Children’s Pythons also enjoy climbing so you can provide branches for them but you must ensure they are secured so they will not fall and injure your snake. Children’s Pythons can be kept in pairs and trios but will need a larger enclosure such as a 40 gallon breeder to give each snake adequate space. They should also be fed separately outside the enclosure to reduce the risk of them injuring one another. It is also crucial to always have a bowl of fresh water available for your python. The bowl should be large enough that they can soak in it and heavy enough that they can’t knock it over. Children’s Pythons require a heat gradient within their enclosure so one side is warmer than the other. The warm side should be kept between 88-90 degrees and the warm side around 80 degrees. You can achieve these temperatures using a UTH, heating tape, or panel heat. It is crucial to monitor the temps so you know they stay within the accepted range so using a thermostat is recommended. 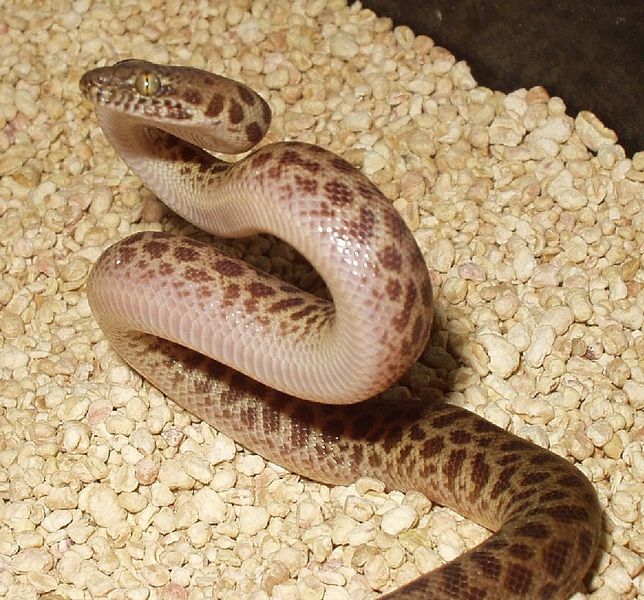 Aspen bedding appears to be the top choice for these snakes as it can easily be spot cleaned and should be fully dumped and replaced at least every other month. You could also use paper towels or newspaper but make sure you provide enough hides for them to feel secure as they won’t be able to burrow underneath it. Baby Children’s Pythons should be started on small pinkie mice with the size of the mouse increasing as the snake grows. The size of the food should be slightly larger in girth than the snake as there should be a bump after the snake has consumed its prey. On average, Children’s Pythons will eat one mouse a week but it is best to track their eating habits for your own records and in case the animal needs to see a vet. A snake shouldn’t be handled until 48 hours after it has eaten to allow it time to digest properly. Children’s Pythons usually shed about once a month. When they are getting ready to shed their eyes will become a milky white color and at this point you should leave them alone until the process is finished. If the shed doesn’t come off in one piece you can offer a humid hide to help remove any remaining shed. Children’s Pythons tend to be docile snakes but like many other species can be jumpy and occasionally nippy as juveniles but regular, tender handling should help break them from this behavior.